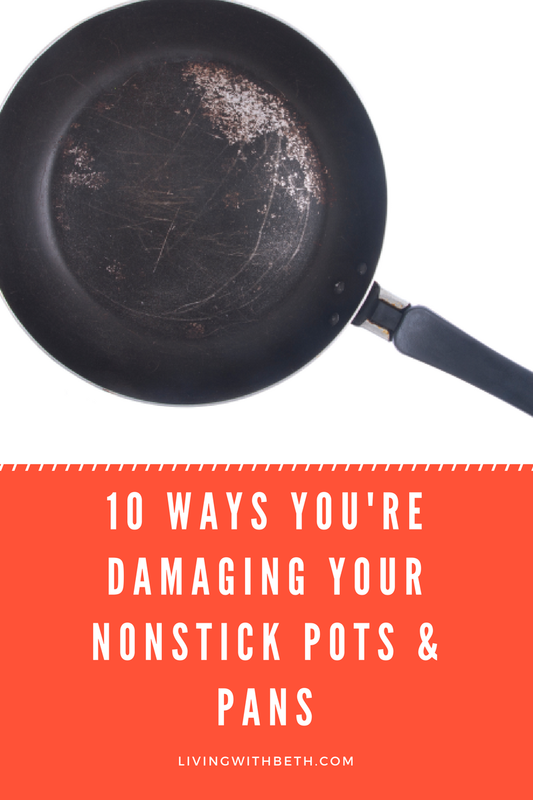 Nonstick cookware is so common and so much a part of our lives that we probably think very little about how to properly use and care for our pots and pans. Unfortunately, you’re probably doing some things that can shorten the lifespan of your pots and pans. 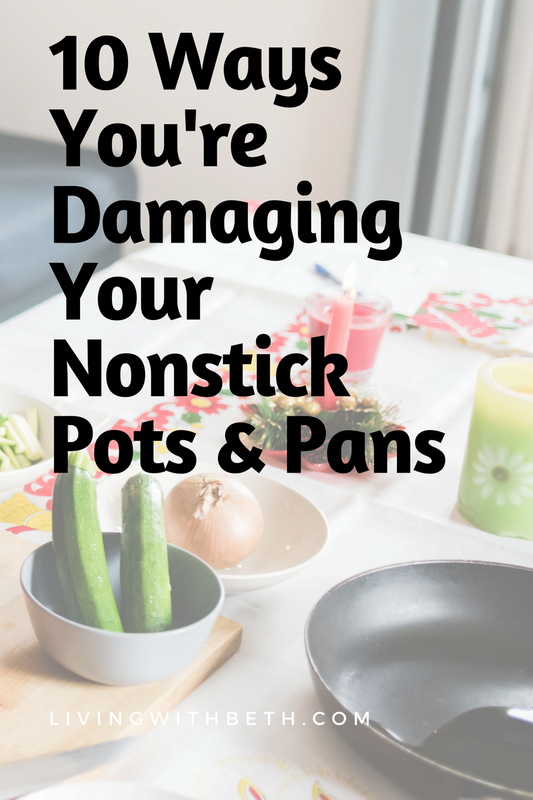 Here are 10 ways you might be inadvertently damaging your nonstick pots and pans. Most pans come with handy instructions telling you how best to care for and clean them. I tend to buy my pans separately over time rather than as part of a boxed set. Therefore, I like to stick to certain general requirements so that I don’t have to remember instructions for different pans. It’s hard to remember general care and cooking requirements if they’re different for every pot and pan in my cupboard. Buying a set of pots and pans usually means getting some items I don’t need and don’t really have room for in my cupboard. Metal utensils will scratch your nonstick pans in a hurry. Stick to soft rubber spatulas or spoons or wooden spoons. Though all of my frying pans have nonstick coating, most of them require some sort of help in the form of oil or oil spray. Instructions for many pots and pans recommend against using nonstick sprays such as Pam, since they can build up on the nonstick surface over time and decrease the lifespan of your pans. This doesn’t seem to include oil sprays, which spray actual oil on your pan rather than some other nonstick substance. You can also choose to pour a small amount of oil into your pan before using it. My favorite pot is my new Gotham Steel Pasta Pot, which I use all the time as a Dutch oven and all-purpose pot for making chili, meat sauce for pasta and many other dishes. 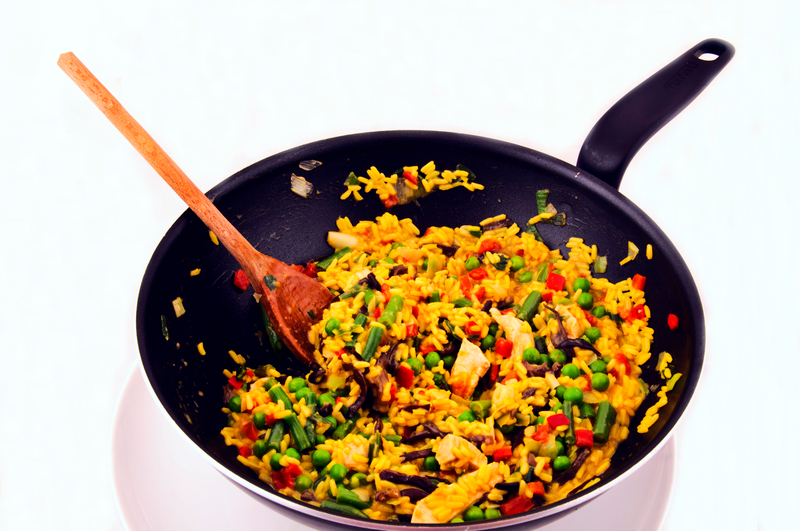 It offers a truly a nonstick surface – no oil required. I also love my new copper coated fry pan, but I don’t remember the brand. It came from Ollie’s, but it’s similar to the one pictured above. Like the Gotham Steel pot, it doesn’t require any cooking oil and nothing sticks to it. If you use a dishwasher at home, read the label before buying a pan. Make sure it says on it that it’s dishwasher safe. I realize dishwashers are probably bad for nonstick pans in general, but most of my pans last for many years through numerous cycles through the dishwasher. I won’t knowingly buy one that you can’t put in the dishwasher. The whole point of having a dishwasher is to wash my dishes so I don’t have to wash them by hand. Once the nonstick Teflon surface starts to wear off of a pan, you really need to get rid of the pan. Though toxicologists consider Teflon save to use, you shouldn’t eat the little flakes that come off when the surface starts to degrade. It’s important to note that not all nonstick pans use Teflon, and many manufacturers have stopped using the ingredient in Teflon that some believed could cause health problems. Even if new pans don’t contain polytetrafluoroethylene (PTFE), I still don’t want to eat it when it starts breaking off into my food. Regardless of what nonstick coating your pans employ, as soon as you see chips or scratches in the nonstick coating, chances are that food will start sticking to the pan. Fortunately, good pans don’t have to be that expensive. I’ve had pricy pans that performed poorly and very cheap pans from Big Lots that lasted for more than a decade. T-Fal is my favorite brand (available at Big Lots, among other retailers). Your pan’s instructions may tell you how much heat the pan can handle and/or whether the pan is oven-safe. Never put a pan in the oven that doesn’t specifically say “oven safe” on the label. Using Teflon nonstick pans is believed to be safe, but you could experience flu-like symptoms from fumes if you overheat a Teflon pan. Personally, I stick to actual baking dishes – metal or glass – to be on the safe side. I use my pots and pans only on the stove. Heating an empty pan can damage the nonstick surface, so be sure to at least put some oil in it before turning on the burner. If you Google “heating an empty pan,” you’ll find loads of different opinions on the subject. One thing’s for certain, though – if you heat an empty pan, at some point, you’ll get distracted and forget you left an empty pan on the burner. That’s a sure way to ruin a nice pot or pan. 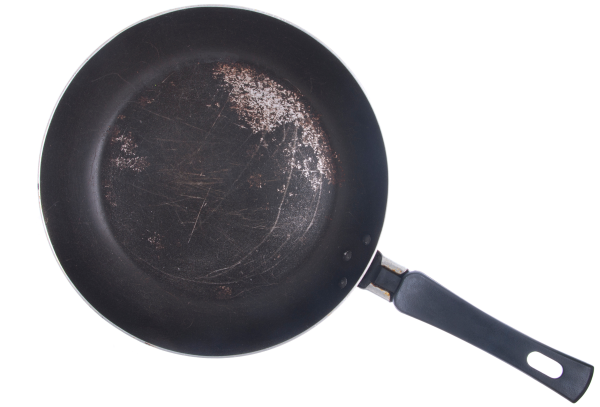 Some nonstick pans can handle repeated bouts with burned-on food. Some will be hosed after a single accidental burning. Even on more hardy cookware, burning your food over and over again is hard on the nonstick surface. Here’s another reason why it’s important to read and save the instructions that come with your cookware. Some Teflon cookware manufacturers recommend using only low or medium heat when cooking with their pots and pans. It’s best to let your pan cool down a bit before shocking it with cold water from the sink. Dousing a hot nonstick pot or pan with cold water can cause it to warp. Leaving pans set before rinsing off certain types of foods can leave stains, particularly from tomato-based sauces or other colored, acidic foods. I’ve had this happen, especially on pots with white nonstick coating. It’s also important to avoid using steel wool or abrasive cleaners, which can scratch and ruin your nonstick pans. Using metal utensils is the biggest problem as well as cleaning it with metal sponges. I honesty dont know why they still make metal cooking utensils. Awesome post, we didn’t about that, really helped me with my nonstick utensils from next time I will follow your ways which will help me. Thanks for sharing your post.